After years in the sub-basement of Boston's teeming underground music scene, Lennon-spectacled wordsmith Mark Zodiac is used to enduring abuse, neglect and indifference for his music. And that's just from his own band. But when he's thrust into the spotlight on the night of Shadowland's record release concert, the crowd tunes in as never before - much to the chagrin of Mark's best friend / Shadowland's star-in-waiting Will. With the record moving up the charts, their ego-librium gives way as Mark strives to keep control of his music without selling his soul in the process. Complicating Mark's world is the shadow of the loss that both drives and haunts him, even as he attempts to find love amidst the graffitied alleyways of Kenmore Square. On the eve of stardom, Mark must decide if being the NEXT BIG THING is really the most important thing. At once disarmingly absurd and heartbreakingly real, NEXT BIG THING combines the gritty backstage vibe of Roddy Doyle's The Commitments with the emotional thawing heart of Jay McInerney's Bright Lights Big City, and every page crackles with the kinetic current of true rock'n'roll. "Kitchen gets all the details right - I felt myself back in the Rat, the Channel and the other clubs of that era - but most of all, he gets the underlying sense of adventure. NEXT BIG THING reminds me just how much it all meant and how exciting it was." "Terry Kitchen, a master at weaving tales through song, chooses a new storytelling-delivery-vehicle for his latest work. His vibrant characters come to life in the pages of his delightful first novel - a frighteningly accurate account of the fight to become rock and roll's NEXT BIG THING in 1980s Boston. As a survivor of that music scene, I could smell the smoke and stale beer of the clubs, feel the damp of the basement rehearsal spaces - as well as the warmth of friendships forged at a time in life when anything seemed possible. An honest, amusing and highly entertaining read." "****. A great debut novel." 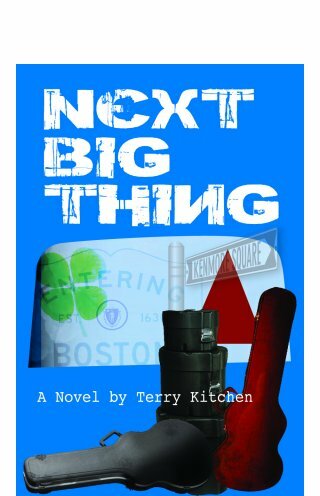 Reviews of NEXT BIG THING : Now an audiobook! The soundtrack is free with the purchase of NEXT BIG THING! On the Acknowledgements page of the book you'll also find a download code - enter the code on this page to listen to or download any or all Songs from Next Big Thing. or for iBooks, search iTunes or the iBookstore for "Terry Kitchen"